The first solo album from I See Hawks in L.A. lead singer Robert Rex Waller Jr. is available soon (July 1, 2016). On the album (a collection of his favorite songs), Waller covers the material in a variety of styles. The album features several Hawks and many other fine musicians, including Robert Rex Waller Sr, Nora Germain, and Marc Doten. Each song is a jewel. Part of the allure is that the curating here is impressive; the blend of obscure and renowned tunes complement each other. Some are stripped down to the bare essentials, others are enveloped in infinite sound. As can be expected, Waller digs deep into each song and offers profound interpretative skills. 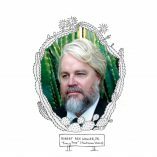 To be covered by as esteemed a singer/songwriter as Robert Rex Waller, Jr. is an honor only outdone by Waller’s impeccable treatment of each song.